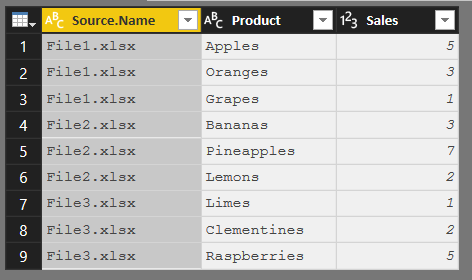 …and you’ll also see that the next step in the query, “Expanded Table Column1”, uses the Table.ExpandTableColumn function – the M function that gets called if you click the Expand/Aggregate button in the column header highlighted in the previous screenshot – to flatten these nested tables out. And the problem is that Table.ExpandTableColumn needs to know in advance the names of the columns you want to expand. Now this is an extremely common, and powerful, Power Query/M pattern. Apart from the “From Folder” functionality for automatically combining data from multiple files it’s something I find myself building manually all the time: write a function, for example to make a single call to a web service; create a table containing one row for each call to the web service that I want to make, use the Invoke Custom Function button to call my function for each row, and then expand to get all the data from all the function calls. And the more I use this pattern, the more I run into situations where I don’t see columns I’m expecting to see because I’ve done an Expand in an earlier step that has a hard-coded list of column names in it (it’s a very similar problem to the one that Ken Puls blogged about here). It’s a pain to have to keep changing this list, and the real problem comes when you don’t actually know in advance what the names of the columns to expand are. One solution would be to do something similar to what I show in this post: iterate through all the tables in the table column, find a distinct list of column names, and then use this list with Table.ExpandTableColumn. However, there is an easier way to handle this: use Table.Combine instead of Table.ExpandTableColumn. The great thing about Table.Combine is that it will always return all of the columns from all of the tables it’s combining. With no hard-coded column names you’ll now always get all of the data from all of the columns in the tables you’re trying to combine. thanks for the interesting blog, I have a related question please. Suppose that I have two tables T1 and T2 with columns named from A1 to A10 for table T1, and from B1 to B9 in table T2. What is the m script that I need to write to get a new query containing appended data from both tables and without duplicates, data must come from (A1, A2) and (B1, B2) fields only and respectively. in another words I need a query with two fields A1 + B1, and A2 + B2 with distinct values from all tables. I’m not sure I understand what you want to do here exactly, but if you know the column names in advance can’t you just rename the columns from T2 and do an Append? Functions are not necessarily bad for performance – you could rewrite this to avoid using them fairly easily, but I’m not sure it would make much difference to performance. What happens if someone changed the name of an already existing column. Like changing “Employee ID” to “EMPID”. Using the custom function, I suppose you would end up with two columns, one for Employee ID and one for EMPID, which would need to be combined later in the ETL steps. At least you don’t lose the information, which is a big help.